There was a visitor to my most recent taijutsu class. Taller and burlier than the average guy in my group, he brought out all kinds of teaching opportunities and points. Just so you know, I’m a scrawny fellow, and most of the people who turn up for my class are scrawnier than I am. That means that the body types we get to train with in class are quite limited. So this visitor was really welcome! We continued to work on ganseki otoshi done with the hanbo. And some interesting points came up. Much sure your opponent is off-balanced when you move in. If you don’t you are vulnerable to all kinds of nasty stuff, from groin kicks to throws. And if your opponent isn’t off-balanced when you move in, odds are that you will not be able to make the ganseki otoshi work without forcing it. I’ve said this before, but it bears repeating. Don’t step unless your opponent is off-balance. If you pay attention to the arts that do not emphasize taking the opponent’s balance (boxing, muay thai and all that), you’ll notice that they don’t step forward with the back leg very much. They keep the same leg in front almost all the time, and do shuffling footwork when they are within their opponents’ reach. There is a lesson for us there! If you capture the opponent’s balance (your hanbo on his elbow) but he regains it by the time you get in (and you have to struggle to make it work), that means you did not maintain pressure on the elbow as you stepped in. That allows your opponent to regain balance and gives him an opportunity to counter, or at least delay your techniques. And the longer you take to make things work in combat, the more opportunities you give Murphy’s Law to work against you! In this technique (as I taught it), most people let up the pressure during the yoko aruki. As they step in, their hips rise up slightly at the mid-point of the step, and that is the split second a resisting opponent needs to counter your throw or make your life miserable. Taller people tend to have problems with this, because they usually don’t need low kamae to create distance. As a result, they may get away without training low kamae and wider steps, which expose such loopholes. To illustrate this point, we went back to the regular, unarmed, ganseki nage. A typical ganseki nage, as I teach it, applies force in two directions: across, as you move your opponent’s elbow to capture his balance and leverage his arm into position, and towards your opponent, as you step in. If all goes well, then you apply the force across again and the opponent is thrown. Nice! If the opponent resists your across-action when you start the technique, maintain the pressure on the elbow to give him something to fight against (and keep his attention occupied), then apply force towards your opponent. Think of sending him backwards, and hit him with your elbow along the way to help him along if necessary. If the opponent resists your movement towards him, push in a bit more. Then when he pushes back take his arm and apply force across. When done correctly, this second move can send a spiralling force into your opponent’s body, leaving him wanting to spin around but unable to. The balance is totally gone at that moment, and he is embarrassingly vulnerable to pretty much any follow-up move you wish to try. How did I know? For this one I was the uke and went guided the guys through one by one. And if 3 out of 4 can have me spiralling in weird ways, it can’t be a fluke! Whether you are doing ganseki with the hanbo or unarmed, it is important that as you step you control the opponent’s front foot, by putting your foot next to it. If you don’t he can easily step around your throw, since you have nothing to throw him over. The interesting thing is this: when you have to put your foot in contact with your opponent’s foot, both sides have the opportunity to do ankle sweeps on each other. If you don’t capture your opponent’s balance when you step in, he can sweep your foot. And you can also sweep his foot, if you messed it up on your way in and he is able to provide effective resistance to your throw. Give him some tension in the upper body to fight against, and when he is distracted sweep his ankle. So who is going to be able to sweep who in this situation? Whoever is better skilled! As I guided the guys through using the ankle sweeps and other forms of resistance that they could encounter, I was struck by the realization that once you move too close to an opponent, you lose much of the advantage and leverage a stick gives you. The stick becomes a distraction for both you and your opponent, when what we want is clear-cut leverage and advantage. When using the hanbo, we can stand at a distance and keep clouting that guy, or move in closer and use the stick to control and lock up the opponent. But we have to be aware that if we don’t control the distance well, the opponent may try to move in even more to smother the stick and remove most of the advantage that we have. So watch out for that as you train! And that, by the way, is how I train in counters. Every time I see one more piece of the puzzle, one more factor that a student needs to make a technique work, that is one more area that I can try to mess up for an opponent trying to do the same technique on me. Anyway, the next lesson is going to be my last lesson on hanbo for the time being. It has been loads of fun focussing on this weapon, but I think it’s time for me to go back to the unarmed material and continue exploring from there. Finally, here is a photo of us from that class. 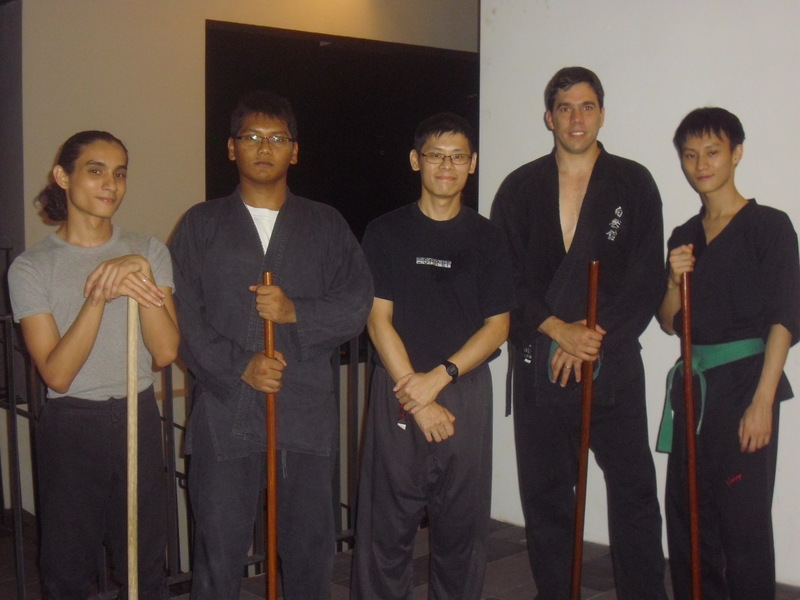 That’s the five of us, after a fun session with sticks!